We know you’re chomping at the bit to find out when the Nexus 5 is going to land in T-Mobile’s retail stores. 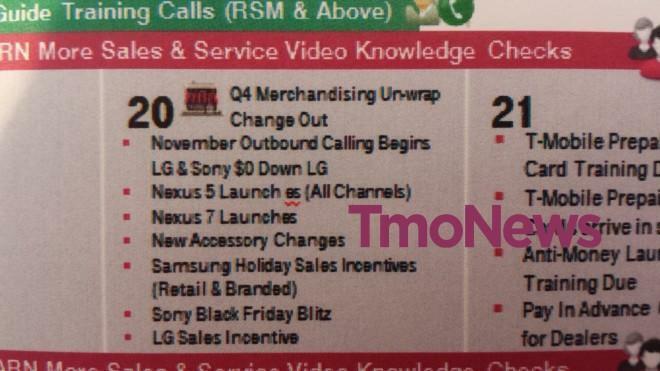 The image above shows what is purportedly the retail planning guide for November. Clearly – in the planning – it shows that along with a few other bits and pieces (including some sales incentives and merchandising change out), Tmo appears to be preparing for the Nexus 5 and Nexus 7. If the guide proves to be right, the phone should land in stores on November 20th across all channels. This is all the information we have as of now, and it’s by no means 100% confirmed. We still need to find out a lot more about pricing, availability etc. Our source, who shall remain anonymous, simply stated that this is the guide management is going off for this month. And, if that’s the case, we should be looking forward to a Nexus 5 landing in little over two weeks. We also know that – in the past – our magenta flavored carrier has been known to launch devices on Wednesdays/Thursdays, so it could well fit. We’ll keep you up to date with any further information as we get it. Let’s just hope they don’t put a huge premium on the device. (As I typed that sentence, something told me that hope was in vain.) Will any of you be picking up a Nexus 5 from Tmo, or would you rather pay for the handset in full and order it from Google Play? Already ordered it from Google Play. I’m going with the theory that T-Mobile will charge more for the Nexus 5 than the Play Store does. Pay more and wait longer? Nah. Got mine yesterday and it’s awesome! Mine should come today. I will join you in new Nexus happiness land soon! Most likely they will charge about $100 more like they did with the Nexus 4. Which is about the same price they sell the Galaxy S III for. Also I’m sure like last time they will only carry the higher end model so expect just the 32 gig version only. My wildest guess is that they will make white an online exclusive. I figure that they’ll charge $450 for it BUT they did have the higher storage version of the 4. It might actually be worth it. I’m planning on waiting to see what T-Mobile is going to charge. A new device isn’t in the budget right now and I don’t really wanna put it on a card. I’ll probably buy it through T and make payments as long as it’s not over $450. Although, with taxes and shipping, the price will be closer to $480. I don’t know. Maybe I’ll end up putting it on the card since it was only $364 with 2 day shipping through the Googles for my sister’s N5. Hell, maybe I’ll even wake up and realize that I don’t need a new phone since I barely got my N4 in June. Yeah, I’m still going to get it even with the delay but I’m going to just sign on for a 2 year payment plan with T-Mobile. I know I’m paying more in the long run but I would rather have more Xmas money. My Optimus L9 was way to much of a compromise device because of its cost so I am very happy to get rid of it. Consider what price differences you posted. If your prices of $480 vs. $364 are accurate, you are paying an additional $124 to finance the phone through T-Mobile. Will you end up owing $124 in interest payments to your credit card company if you get it from the Play Store now? It’s funny you mention that. I probably wouldn’t be paying that much interest on the card BUT I also don’t want to add more debt to the CC. I’m trying to get my score up and yeah, it’s only $363 but every little dollar that goes onto the CC adds up and affects it. Plus, if T-Mobile is selling the 32gb version, it’s not AS bad. I’m actually going back and forth. Do I need the phone? Nah… my N4 works just fine. And a smart person would use the money to pay DOWN one of the cards. I used to be in the same situation, but music was the cause. I said that I would put myself on a music “diet” for one year. I seriously cut back on the amount of music that I bought, but didn’t tell myself that I could buy no music at all and I didn’t tell myself that I would have to be restricted forever. The absolutes are usually what gets us when we try to change our habits. After a year, I had learned to be happy with less music. I never returned to the buying levels that I had prior to the “diet”. After getting on better footing, I’ve adopted a new habit, phones. However, I plan in advance for these purchases, versus music used to be an impulse purchase when I caused myself problems! The sad thing is the average consumer probably doesnt even know the device is at Google Play for $100 less. Ironically the device part of Google Play doesn’t show up on Android phones. Not sure why you wouldn’t want current Android users to be able to take a look and buy devices from their phones. Ah booooooo T-Mobile. This is pretty terrible if this is true. I hate waiting. Reliable T-mobile manger told me the 19th…. I got my Nexus 5 from Google today and I have already swapped the sim card over, copied my apps and moved my data. Works great on T-Mo!! You don’t even need the developers. If your rooted then you can use Titanium Backup Pro and it can backup the entire app and contents. You need to learn to just root your phone so you can backup apps. makes things so much better. I assume this will be the same version from the Google Play store, i.e. no Wifi Calling? 2 of them if the price is right but it will probably be way more versus purchasing via Google Play. I will ultimately wait until I have the money to buy them outright. Spending more just to have it sooner is a waste. The big question is not when but how much. What will Tmobile charge for the device? I don’t understand why Google again did not have quantity. Many people want to give these phones for the holidays. The 16gb on Google Play is showing waits of up to 4 weeks. Maybe still in time for Christmas but forget those who wanted to give the phone for Hanukkah (which starts early on Thanksgiving Day this year). The other issue is when will it appear at retailers like Target,Best Buy etc and wilt hey sell it at the Google Play prices? I know a lot of people (not the blog readers here) want to see and touch a phone before ordering it. Google has quantity. Last year they had a 2 month gap where they had no phones. Right now even the 3-4 week wait (only the 16gb is that long it’s 2-3 for 32gb) seems to be very soft since people that ordered 2 days after the phone was released are getting shipments. This is nowhere near as bad as the Nexus 4. Also Best Buy is getting theirs on the 8th just like Sprint. I was really hoping all retailers be getting it on the 8th but that doesn’t seem like it’s happening. My 32 gb arrives this Friday the 8th. I ordered mid day when it was released as I had no idea Google was releasing it that day. I was surprised there were any to purchase, and it said ships by the 8th. Well, it shipped alot sooner as it turns out. RadioShack is expected to get theirs on the 8th, but from what I understand, they’ll only be selling it for Sprint, and off-contract prices are $100 more than GP. Tmo didn’t charge much more for the Nexus 4. I ordered the 16GB black Nexus 5 from GP and it says 3-4 weeks until it leaves the warehouse. I’ll see if in two weeks what TMO charges and cancel the GP order if the price is close. I’ve also seen orders shipping faster than GP is estimating. They are probably being careful this time with not over promising. Google really needs to prepare better when launching a device. One thing Apple does right is they have quantity and many places to purchase at the time of launch. Much more? A $100 more than the Google Play store is quite a bit more an most people’s lives. The Nexus 4 for T-mobile is still $427, which was sold at the end for $250 by Google Play. I think the people that waited a month for the gold iPhone 5S will disagree with you on your last sentence. Was the Nexus 4 that T-Mobile sold of the unlocked variety and does anyone think T-Mobile will lock the Nexus 5? The Nexus 4 was 100% sim unlocked and I am sure the Nexus 5 will be as well. I am sure Google has a say on that. To me, and I started with the Nexus 1, if it’s locked, it’s not a Nexus. Period. If our nexus 5 does not include wi-fi calling, there should be NO reason to make the phone more expensive than it actually is like they did with the nexus 4. It pisses me off that TMO STILL hasn’t lowered the price of the nexus 4 and is end of life! Especially when the N4 sold for $250 for the 16GB verzion at the end through the Google Play store. In my opinion, they’ll probably release it at the same mark-up as Sprint. Honestly, it’d still be a steal. I’m unsure if i want to buy from google or tmobile… if i get it from gp its $389 for the 16 gb where as if i buy from tmo… it will most likely be $0 down and even if my eip is $20 a month. i would only pay a total of $240 for a year then i could get the next gen nexus all over again and pay $150 less…Does this make sense to anyone else? It’s true that you’d pay $240 at $20/month for a year but you forget the fact when you buy a phone on an EIP it’s for a 24 month period not 12 months. EIP is just an installment plan to make a phone’s retail price more affordable/accessible but you still HAVE to pay the entire retail price. So you can’t just pay $240 for a year, upgrade to the new nexus and expect T-Mobile to forget about the other $240 you owe them for the Nexus 5. In fact if you did upgrade with having only paid off only half of the Nexus 5 that balance would be added to the upgrade phone’s pricing next year. You seem to be horribly misguided about EIPs. I’d look into it further and get a better overall understanding of it before making any commitment. Well if that’s true and the process is as hassle free as you put it then I guess yes it would be cheaper to lease than to buy. You also would have to add in the $10/month that you would pay for JUMP! fees over 12 months or $120. If you buy insurance anyway, this isn’t a concern, but you wouldn’t have this fee if you got the Nexus 5 from the Play Store and didn’t get insurance on your phone. well you have to return the device with no damage so that would be like selling it back for $110 in very good condition to T-Mobile. the plan only makes sense for $600++ phones upgrading at least once a year. Was wondering when it would be there. I ordered the Nexus 4 from Google last year and may do the same with the Nexus 5 this year. However, I’m debating on getting a Galaxy Note 3 instead and I see on this leak that Samsung phones will be on sale on the 20th as well. Hmmm, I think I’ll wait and see what the 20th brings. One reason I prefer to purchase from Google is that their customer service has been terrific, and when sending a replacement, it’s a new device, not a refurb. The carriers usually replace with refurbs unless something changed. Even Apple won’t send a new replacement in most case, but what they call a refreshed device (gimme a break Apple). it’s 50/50 w/ tmobile…if it has a bunch of tiny factory stickers around it..it’s new..but if it has a cheap plastic sticker on front and back..it’s refurb….so it’s a gamble most of the time..but a nexus device doesn’t come w/ factory dust protectors out of the box like most phone makers have…so idk if you’ll be able to tell…..i guess if it has no stickers it’s a new one..w/ sticker it’s a refurb…..
My Nexus 5 arrives this Friday (from Google). I prefer to purchase it from Google because if replacement is needed, they replace with a new device vs refurb. Something to consider I guess. I like that myself but if you can’t throw down the bucks all at once, the TMO option is a great one for some. I see there is a new charging dock or pad for the Nexus tablets and Nexus 5. The orb I purchased was replaced twice because the N4 would not stay on it. It would slide off and end up with a dead battery. The 3rd orb is working great. 3rd time’s a charm. A real “uncarrier” move would be to box this bad boy in a prepaid box and sell it at $299 through Wal*Mart…undercut Google by $50 and replace the ancient Galaxy S2 in the prepaid lineup. T-Mobile would lose so much money on that without adding any valued customers in. Look at the price they sell the Nexus 4 for now, $200 more than Google sold it for at the end. They’ll jack up the price with the Nexus 5. It’s not “jacking the price up” if they are charged more for the device by LG than Google is charged and Google is also subsidizing their sales. That was the.case with the N4 and is likely to be the case again this time. Take away a Google subsidy, add additional charges from LG plus the margin to cover TM’s distribution and support costs and you could easily see a $200 price difference without TM making an extra dime. Link that states that T-mobile or any other carrier pays more for the phone than what Google sells it for? Otherwise it’s just conspiracy theory talk. T-mobile makes quite a bit of money on their phones they sell, I know because I used to see the actual prices of the phones when the reps could buy the phones at cost. I’ve posted those links in the past but don’t have time to search for them now. Look up the row in Europe (Spain was one location IIRC) where various distributors declined to carry the N4 because they were being charged uncompetitive prices by LG that couldn’t match Google’s direct pricing. I’ve also posted links in the past to documents from the Apple v. Samsung court case which revealed the unit prices that TM was paying for various Galaxy devices, and indicated the margins that were being made from their use of the MSRP. No mention of the Z1 launching… That’s disappointing. March and it will be exactly 6 months since jump. Why not buy the C6903 international model? It runs T-Mobile LTE. No mention of Z1, but the “Sony Black Friday Blitz” looks interesting. Shouldn’t that be really on Cyber Monday? I ordered my Nexus 5 within 10 minutes of it going live on the Google Play store. I got mine yesterday, popped in my T-Mobile micro SIM and an hour later, T-Mobile completed my number transfer from Google Voice. Service so far is great. Even though I’m in Madison, WI where LTE recently launched, I don’t have LTE at home. Coverage gets to within a half mile of my house according to Sensorly, but LTE here at work is great. I’m looking forward to continuing coverage improvements. I know this is off topic, but I see that Microsoft website has the Lumia 1520 for AT&T up for preorder – $549 no contract – releasing next Friday. This will work on T-Mobile’s network for LTE and 2G, but you won’t get the HSPA+ fallback unless you are in a refarmed area for the 1900MHz band. The bigger issue will be getting it unlocked, as it will still be locked to AT&T. In the recent past, AT&T won’t unlock exclusive phones for six months from the release date. I think the 1900 mhz reform and the lte deploys are the same areas. Yeah, I thought so, but I wasn’t sure. Thanks for adding this. I avoided getting one from Google Play because of their stupid refund policy (money goes into Google Wallet (that I’ll NEVER use), NOT back to my credit card). If everyone who isn’t Google will charge more than GP, I guess I’ll never buy one. I got a refund on my HTC One GPE and the money went back to Google Wallet, then back to the credit card that is associated with Google Wallet. The money ended up back in my bank account. Was it easy to get it back onto your card then into the bank? Any fees? If I can get all of my money back, just like a typical refund would be, then I’ll easily order one and wait for it to show up (or cancel it if Best Buy or RadioShack just so happen to offer it at $350, but I’m remaining skeptical). You may have a reason to remain skeptical. I checked my Wallet account just now. There is confusing information there as it seemed like they processed my refund on June 26th. However, it didn’t show in my bank account until September 6th. I never checked my Wallet account once I returned the phone, I only checked my bank account. There were no fees and I got all the money back. There was an investigation for my return, so that may have held up the money getting back to me. The confusing part was that the refunded amount showed as $0. There is another refund that I have done last week (not for a GP purchase) that still shows the amount refunded in Google Wallet, and the refund has already made it to my bank. I would say that if you don’t want to remain without your money for six weeks, don’t purchase it from the Play Store if you think that there is a high possibility that you will want a refund. My initial goal was to just mess with the Nexus 5 for a while. There’s a chance that my mom or dad would actually end up using it when they switch to T-Mobile next month, but what device they want to use could end up changing, so a 2-week trial is what I was going for. 6 weeks is quite a long time. Reminds me of when I first started using PayPal a few years back and they held onto everything for a while. Just a heads-up, Google does normally charge a restocking fee. I protested mine based on a discussion that I had had with Google prior to me even getting the HTC One GPE, which led to the investigation for my return. Ah… Their refund page doesn’t mention that. Know how much it would be? Even Best Buy did away with those. It was 15% of the device price. I wonder if Google stopped charging the restocking fee. I remember having to be told where I could find it, but I find it odd that it is not on the returns website if they do still charge it. I’ll look through my emails to see if I can find it there. Edited to add: The fee was given to me in an email. There was a link to the return policy that was probably to the same page that you saw; I think that it has been updated now. Also, I think that I figured out the 6/26 refund for $0 in my Google Wallet account. That was when I placed my order, so I’m thinking that the pending charge that was dated 6/26 dropped off of my card and showed up as $0 in my GW account. Thanks besweeet! You helped me out by letting me know that there isn’t a restocking fee anymore. I’d hate to think that I’d return this Nexus 5, but stranger things have happened. No problem. Other good news is that I ordered one. Just hoping it ships sooner than 3-4 weeks from now. And thanks for your input earlier. Any word on HD Voice? Is Nexus 5 compatible? My guess it they will only upcharge 50 bucks but if more..if I get JUMP, it will make up the difference when I switch to the N6 the following year. I have mine! Had my number changed over to a micro SIM in store last night in under 5 minutes. I am now enjoying pure KitKat for $200 less than the sucker who buys it from T-Mo….. I have the Note 3, it’s great!! I got my Nexus 5 yesterday. It’s fast with LTE I pulled 31Mbps down. The screen looks great. I should have waited though before buying. I’ve read where there is supposed to be OTG support. I can’t get it working. I’m reading where other have the same issue and the flash player apk does not work on the Nexus 5 so I can no longer stream Amazon Instant Video which I watch while doing cardio at the gym. Also some widgets won’t come to the home screen. I won’t be keeping it. kit kat is pretty new..so i’m sure w/ time those things are all fixable….OTG from a stock rom would be rare, and that might come later w/ mods and such from the community if you root your phone. Is Tmo going to pull the same crap they did with the Nexus 4 last year ? They wont let you insure the phone unless it was purchased directly through them? yes, because you didn’t buy it from them. buying it from them is the ultimate proof of purchase and they make money and is most likely part of an agreement w/ the insurance company. which nexus 5 works in the U.S d820 or d821? Waiting for T-Mobile to get so I can use the EIP. I don’t have the money for one full price up front. I’m fine paying a small premium to have it prorated. I wonder if T-Mo will load it’s junkware on the N5-s it sells. Then we would probably also have to wait for updates till T-Mo releases them instead of getting them directly from Google as they become available.